This film is a fascinating examination of the life of Albert Pierrepoint, one of the longest-serving hangmen in England. His career spanned from 1932 to 1956, during which he gained the reputation of being the most expeditious executioner in British history. 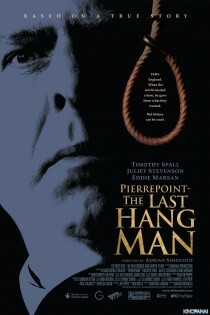 The film was incorrectly titled Pierrepoint: The Last Hangman for its U.S. release. Executions continued in Britan until 1964. Pierrepoint (2005) is a marvellously-made film starring the ever-brilliant Timothy Spall. Whenever I see Spall in anything, I can’t help but think back to his hilarious beginnings as Barry Spencer Taylor in the British TV comedy-drama, Auf Wiedersehen, Pet! You can find more information on this British movie on Wikipedia and IMDb. El verdugo (The hangman) by Luis García Berlanga, 1963. It is also about a hangman, not a real story but as real as it can get. A very good and interesting movie. Ooh, excellent tip. Many thanks! I watched this with a friend on a whim a couple of years ago. It’s really interesting and it stayed with me long after the credits had rolled. These reviews are short. I might have overdone it with mine. Not to piss on your parade or anything, they offer up some information. I saw the film. A great piece of work!! Had never heard of him until I saw the film. Thanks for the tip! There’s a wonderful NYRB title, *A Handbook on Hanging* by Charles Duff (intro by C. Hitchens)–maybe “wonderful” isn’t the right word. Thank you for the recommendation – I’ll look it up. This film is so very English,and for me, evocative of the period when I was young. It is flawlessly set, and the cast manage to get into period perfectly. The haircuts, the clothes, vehicles, furniture, all spot on. One of those classics of UK cinema, alongside 10 Rillington Place, Brighton Rock, and so many others.